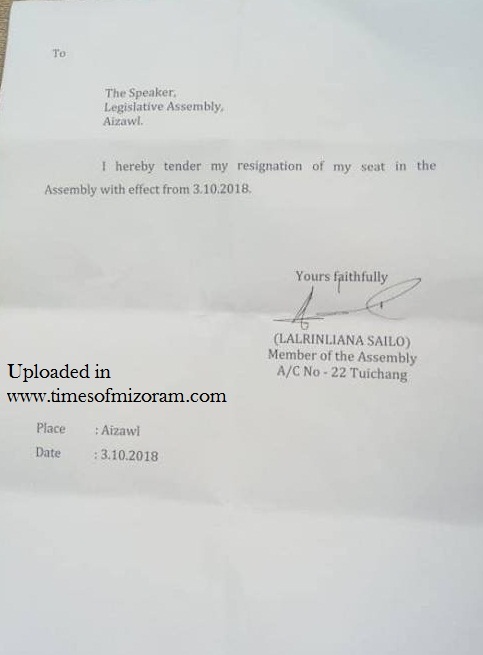 AIZAWL, Oct 3: Threetime Congress MLA Lalrinliana Sailo today tendered his resignation as legislator and subsequently left the party. Minutes after he submitted his resignation letter to Assembly Speaker, Sailo, flanked by a few opposition Mizo National Front (MNF) MLAs and supporters, proceeded to Congress Bhavan where his papers were received by Congress vice president and Lok Sabha member CL Ruala. Sailo’s move has not come as a surprise as he has already hinted, during his final tour to his Tuichang constituency last week, that he would quit. Talking to reporters after he tendered his resignation papers, Sailo made it clear that he would join MNF, but refused to comment on whether he would get party ticket. “Yes, I will join MNF,” he said. Asked to confirm on reports that he would contest on MNF ticket from Chalfilh seat, he said, “That depends on MNF leadership. I can’t say anything now. Sailo was for the first time elected to Mizoram Assembly on Congress ticket from Khawhai constituency in 2003. After delimitation of Assembly constituencies, he was re-elected in 2008 elections that saw the resurgence of Lal Thanhawla-led Congress. He was made a Minister in the Congress Government during 2008-2013. Though he retained the seat in 2013 elections, he failed to make it to the Cabinet. Sources said this was the root cause of his discontent in the Congress. 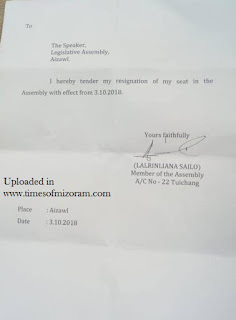 Last month, the second most important person in Congress and Home Minister R Lalzirliana had resigned from the Cabinet and was subsequently expelled from the Congress. Sources confirmed that the duo will join the MNF and contest the upcoming elections.